Ivy climbing along with the steep wall is a plant symbolizing the will with which to achieve the goal in the end by making its way through a long and rough path. Why don't you remind yourself of your wishes looking at the verdant ivy which is closest to your? We added the least design while keeping natural beauty of natural material itself the most. 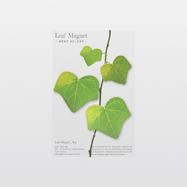 Realistically made ivy shaped magnet can be used for various places like partition, white board, refrigerator and etc and you can create the feeling of ivy with it as interior prop.